With Spring just around the corner I thought I'd share with you the perfect nail polish set for the new season. The Ciate Dolls House contains 5 mini Ciate nail polishes in absolutely adorable packaging that I will be keeping them in. 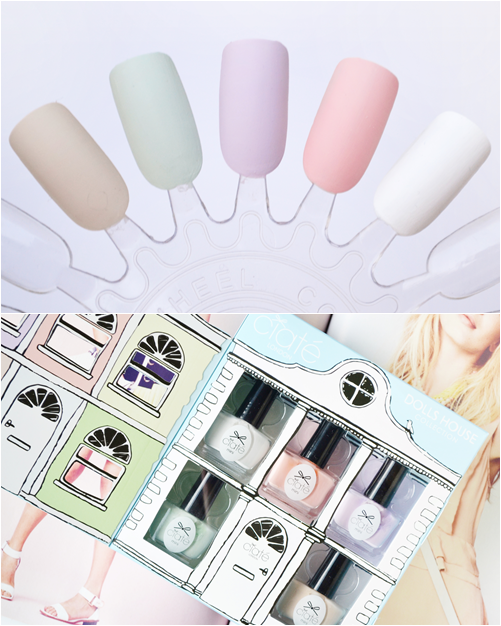 The nail polishes come in a lovely spectrum of pastel shades in a 'porclain' finish perfect for a mix and match manicure. 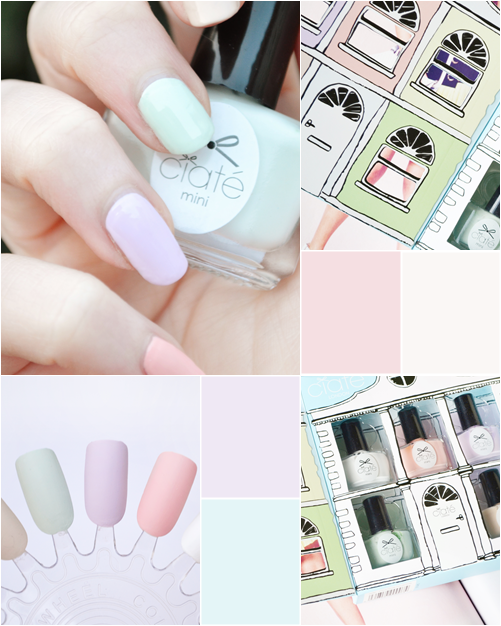 Doll Face, Paper Doll, Baby Doll, Poppet and Sweet Pea all make up this set of sweet pastel shades. My favourite shades have to be Baby Doll (peach shade) and Sweet Pea (pistachio/mint shade). Though I do love how the set contains 5 polishes so you can paint each nail a different shade. Above you can see my own manicure which I've finished off with a clear top coat as I wasn't too keen on the porcelain like finish... the silky look does compliment the pastel shades and isn't fully matte however I do prefer a glossy looking manicure. You can see full swatches below of the true finish of the nail polishes without a top coat. The formula is fast drying due to the semi-matte finish and quite opaque as only 2 coats are needed. Application is also nice good, streaky on the first coat then smooth by the 2nd. These really are beautiful nail polishes and some of the nicest pastel shades I have come across and that is a bold statement as I've come to love pastel nail polish in the past few years and own so so many. Baby Doll and Sweet Pea will definitely be worn alone as they remind me of the shade of macaroons, just so pretty. You can find the set on Look Fantastic for £18.00 here or ASOS here.